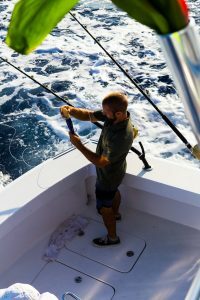 Deep sea fishing in Kailua Kona, Hawaii for marlin and big game fish is a unique opportunity you’ll want to enjoy while visiting this beautiful part of the world. In fact, the Kona Coast of Hawaii is famous for charter boat deep-sea fishing. Anglers come from all around the world to fish for giant blue marlin and other Hawaiian Fish that are great to eat and fun to catch. We fish very close to the Island! In Kona, it’s also possible to fish almost every day out of the year, which affords us a unique opportunity no matter what time of year you visit. 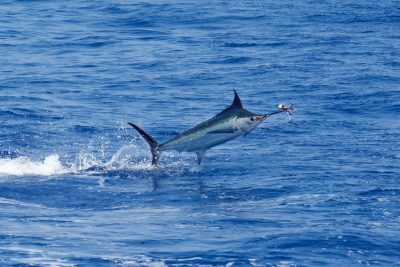 Sportfishing charters in Kona target many species of fish, the most sought-after being the giant blue marlin. There are usually a couple of grander marlin (those over one thousand pounds) taken every year. The other billfish targeted are the spearfish, striped marlin and the swordfish. 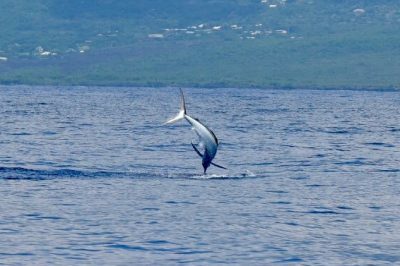 Tuna is also a great sport fish and you will find the albacore, big-eye, skipjack and yellow-fin tuna roaming the seas of the Kona Coast. 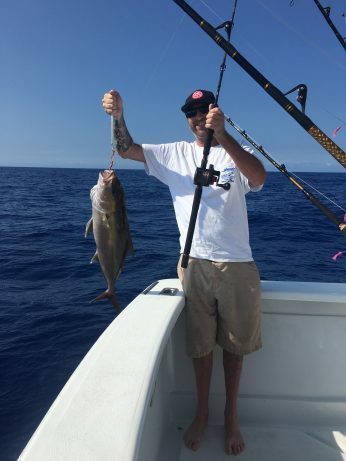 You can also fish for mahi mahi (dorado), ono (wahoo), kahala (amberjack), giant trevally (ulua) and few other minor species. It’s really no wonder that with the varieties of fish, the calm seas, the wonderful Hawaiian weather and the majestic Hawaiian scenery, the Kailua Kona coast is major fishing destination for many anglers around the world. 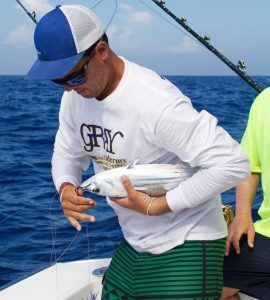 Trolling lures is the preferred and the most common deep sea fishing technique used by charter boats and recreational fisherman in Hawaii to catch marlin, mahi mahi, ono and tuna. The lures used are all hand crafted and locally made in Hawaii. Trolling speed is around 8 knots and we fish 5 lures at a time. When trolling you are covering a lot of water and looking for the fish. The lures are all different shapes, size and colors. This allows us to target all the flag fish not just marlin. The lures are staggered behind the boat and are ran out of outriggers. The outriggers help spread the lines apart and give the lures a little more action. The trolling poles are set in a rod holder until a fish strikes. Once the fish is hooked then the poles are transferred over to the fighting chair where you reel the fish in. If we are trolling around the FAD’s or floating debris, we use the lighter tackle which you can fight standing up. Sheep Dog rigging the live bait? Trolling live bait is the other deep sea fishing technique used for catching the pelagic fish in Hawaii. The skipjack tuna, yellow fin tuna and opelu (mackerel scad) are found around the ledges and FAD’s. The small tunas are a blast for kids and beginner anglers to catch on light tackle and they make great baits. Usually we troll two live baits between 2-3 knots. We stagger the baits between 20-40 fathoms (six feet is a fathom) with a drop back in the line to allow the fish to swallow the bait before striking. When using live bait we are waiting for the fish to come to us and usually fishing where we catch the bait. Catching live bait is not a guarantee and we can not buy live bait as we leave the harbor in Hawaii. Using live bait depends on the currents, where the bait is located at and how much time we have to fish. Bottom dropping for amberjack, giant trevally, snapper and sharks is done by dropping dead or live bait to the bottom. The bigger bottom fish are usually caught at depths between 420-600 feet. This style of fishing is done at an area called “the grounds” which is just north of the Kona airport. When the current and the conditions are right this is a very fun fishery for anglers who just want action. Most of these fish we do not eat because of the toxin ciguatera. So if you really want to target food fish then we fish for the mahi, mahi, ono and tuna. Vertical jigging is also another bottom fishing technique for the big jacks and really popular with the Japanese customers. 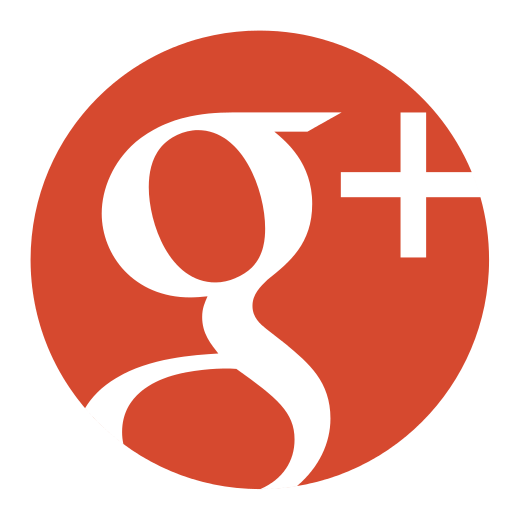 Its the most hands on fishing we do and is the easiest and fastest way to get to the bottom. The jigs are from 6-10 ounces and usually shaped like a knife for a quick deep drop. We use a small light reel with a high retrieve ratio and a braided line with a short stout rod. With a consistent and proven catch record, Hooked Up is here to help you grab some incredible fish for dinner or land that trophy blue marlin you’ve been dreaming of. Either way, we’ll customize your deep sea fishing trip to meet your needs and exceed your expectations.  Hooked Up is great for those interested in catching blue marlin, stripe marlin, spearfish, mahi mahi, ono or tuna – and enjoying that fresh catch for dinner. We’ll fillet your fish for no charge, and you can have it cooked at our family-owned restaurant in downtown Kona. Come see the Kailua Kona coast like you’ve never seen it before!